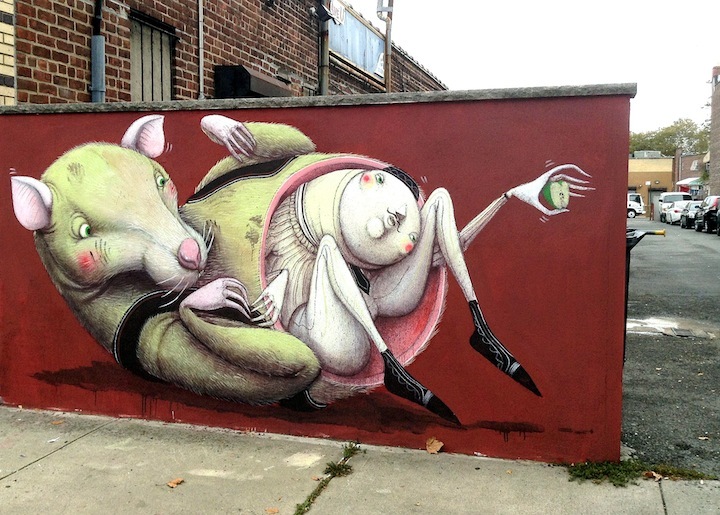 With his wondrous skills, Italian artist Zed1 has been enhancing the walls of our city. 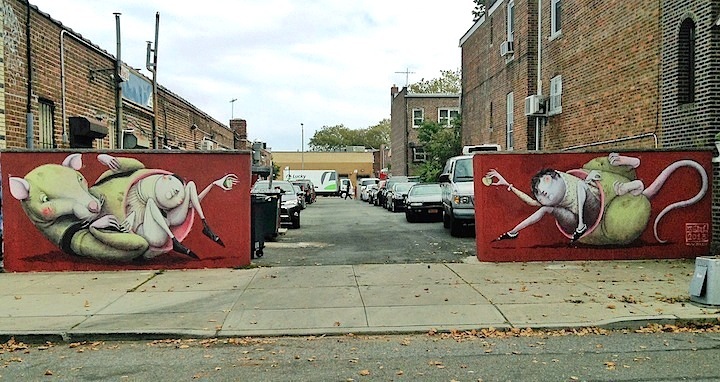 His signature characters have recently surfaced in Brooklyn and at Welling Court in Astoria, Queens. 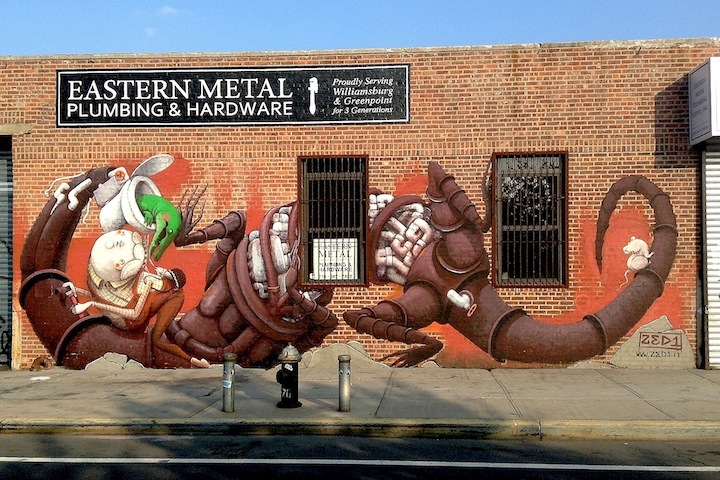 Earlier this month, we stopped by Williamsburg’s Bottleneck Gallery, where he was painting, and had the chance to speak to him. Back in ’93 in Tuscany. I was 16. I started the way just about every graffiti artists does – with tags and letters. A friend showed me photos of graffiti walls in the U.S. that he had discovered in a book store. And then when I began hitting walls, it seemed like the perfect way for me to express myself. Why were you willing to that that risk? I love making people happy by bringing trains to life. I also like the adrenalin rush that comes with painting trains. I was stopped only once. But the police liked what I was doing and let it go. The whole attitude towards graffiti is different back home and the police are different. They are more relaxed. I like the freedom that comes with working without a sketch. But if the wall that I’m doing is especially challenging, I usually bring a sketch with me. No. It always seems incomplete to me. It never feels finished. It has evolved tremendously. I started off as a graffiti writer, but now I am more of a muralist. Also, I am much more concerned with the concept behind the work than I used to be. And I’m intent on communicating with the public. Could you tell us something about your second-skin work – the pieces you create that evolve into something different with time? I came up with the idea about two years ago when I created an animal with the head of a man that peels away to reveal another face. I love giving folks the opportunity to interact with my work and play with my art. And there’s a message here: We all see things differently. We each have our own perspective. And if you want to understand another person’s way of perceiving the world, you must change heads. That certainly makes sense! Do you prefer working legally or illegally? I like both. Working illegally give me more freedom, but working in a sanctioned space gives me more time. Have you exhibited your work in a gallery setting? I much prefer to paint on the streets. It is far more democratic. I don’t like most galleries, and I don’t paint to get the attention of gallerists. I’d rather paint on a public wall than on a canvas. That way I can share my work with everyone, not just the elite. But I am beginning to show my work in galleries that respect my vision. No. I studied graphic design, but I was never a good student. They don’t understand. My mother tries to, but my father has an entirely different notion of “success” that’s tied in with material things. Do you make money from your art? What is the main source of your income? I earn money by doing commissions and I sell art. Art is my life. Is there much of a graffiti/street art divide back home? Not as much as here, and the lines continue to blur. 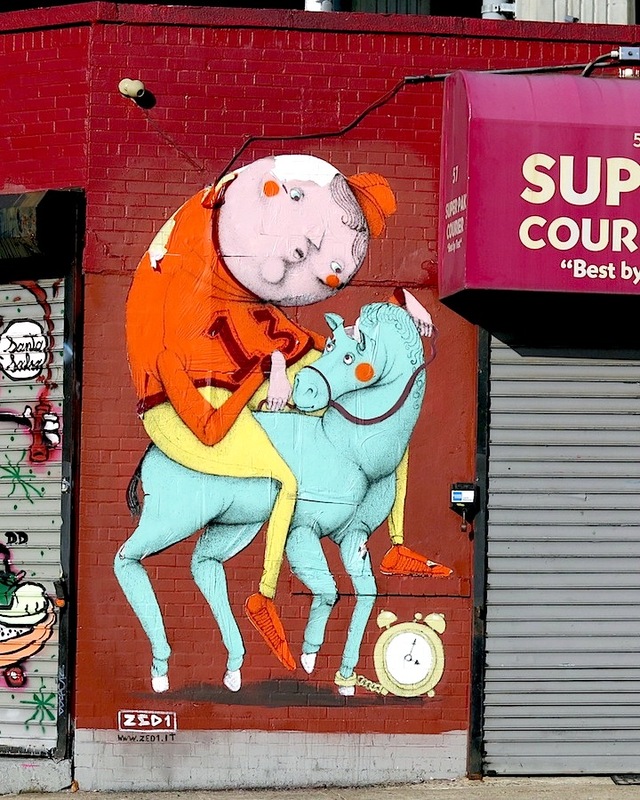 Festivals invite both graffiti writers and street artists, and many writers include characters in their pieces. But there is some tension, as far fewer people understand graffiti. 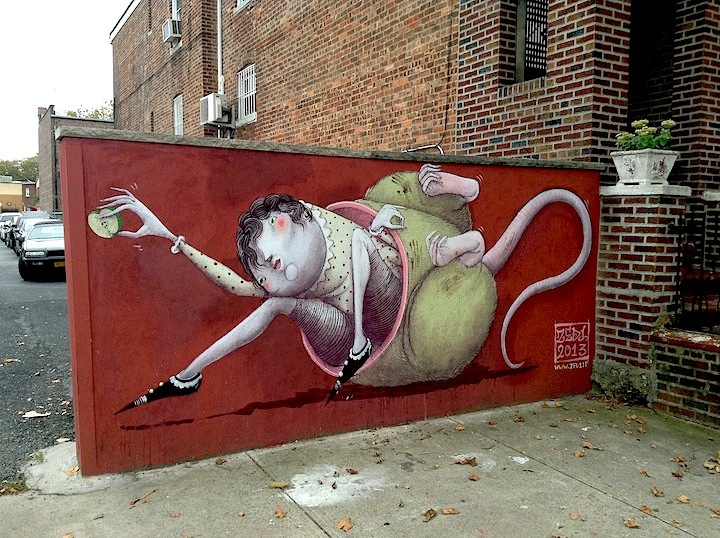 Street art is far more accessible to most folks. Have you painted in other countries – besides Italy and the US? I’ve painted in Denmark, Romania, Norway, Spain, the UK and Brazil. Have you any favorite places to paint? I especially like to paint in poor, run-down neighborhoods. I like interacting with the people who live in them, and I like enhancing their spaces. 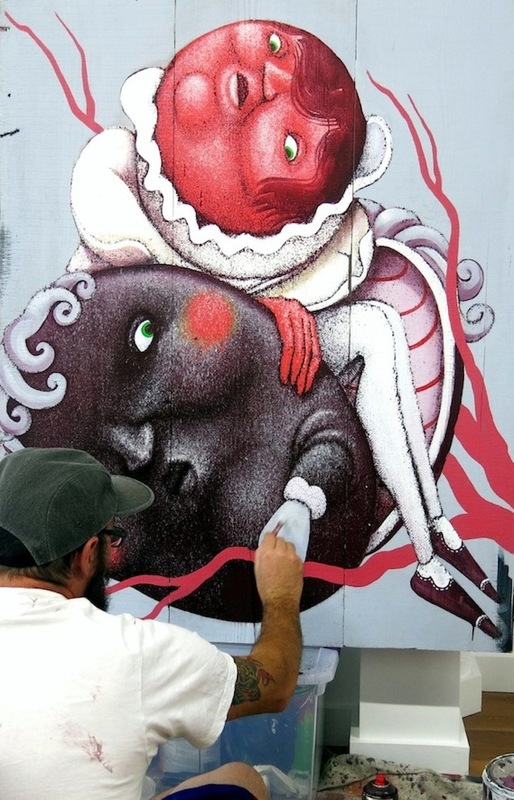 Particular favorites include: Blu, Banksy and Os Gemeos. It is very important. It has given birth to many careers. I can’t speak for other artists. But my role is to communicate with people by bringing beauty into their lives and raising issues they might not – on their own — think about. More travel. I love painting in different countries. And more artworks and videos illustrating my second skin concept.